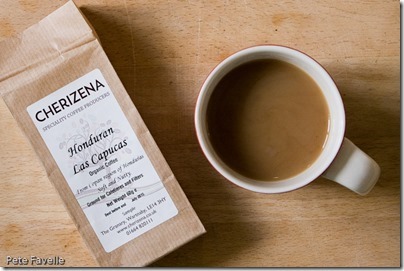 Honduras is firmly in coffee growing territory, with places like Guatemala, Costa Rica and Colombia a geographical stone’s throw away. However, until now I don’t think I’ve ever had the chance to taste any of their coffee. This is, perhaps, surprising given that Honduras is now the seventh largest coffee producing nation in the world, and the largest in Central America. 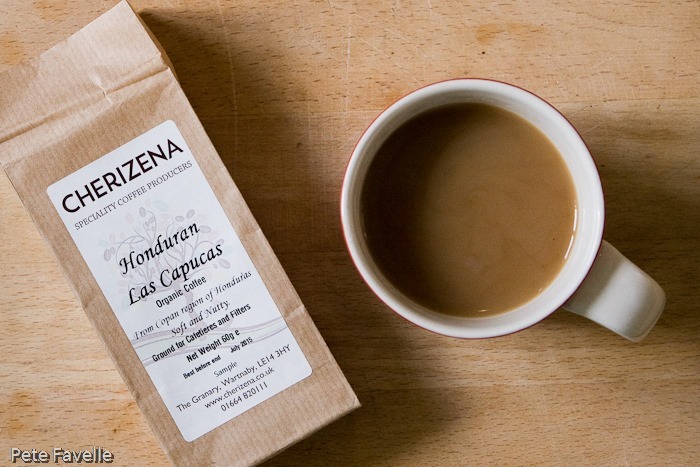 Cherizena‘s Honduran Las Capucas comes from the Copan region of Honduras, best known as the site of the ruins of the Mayan city of the same name. The grounds are dark, and have a sweet, dark chocolate aroma against a background of old wood and just a touch of nuttiness. Brewed, the nuttiness becomes more pronounced and a dark cherry, black forest gateau aroma comes through. In the mouth, it’s surprisingly light with a significant fruit acidity which washes away any lingering sweetness. There’s definitely a richness lurking in the flavour, but the light body makes it delicate and almost tea-like – perhaps not my normal taste but ideal for a hot summers day. Interesting and fresh, I give this 3 stars. Many thanks to Cherizena for this sample.